Situated in the West Village is my favourite Italian restaurant, L’Artusi. I love everything everything about it. It’s lively atmosphere, great service, fresh pastas, and delicious side vegetables make this a must try when in NYC. One dish that stands out for me is their garganelli with mushroom ragu and shaved ricotta salata. It’s the ultimate vegetarian comfort dish. I decided to bring the taste of L’Artusi home and recreate the unforgettable mushroom ragu. I did find a recipe online but it wasn’t quite the same as the recipe I experienced, but served as a good starting point. I adapted the recipe and made it vegan. However, feel free to add parmesan or ricotta salata to garnish. Your pasta, your prerogative. Mushrooms are a great meat alternative. They are rich in flavour, meaty in texture, and have a umami flavour. Using dried poricini mushrooms just enhances that mushroom and umami flavour. In order to make my carb-load nights a bit more nutritious I use Banza pasta. It’s made with chickpeas and therefore packed with protein. Classic semolina, brown rice, whole wheat, or lentil pastas can also be used in this recipe. You can also experiment with different pasta shapes. This recipe makes a lot of ragu. I would add the sauce to the pasta instead of the other way around. This way you can ensure the pasta is coated to your liking. If you want to make dinner for two then you can save leftover sauce for other uses. You can put it in an omelette, spread it onto a sandwich, eat over rice or mashed potatoes, or eat as a snack with a spoon (like me). A vegan mushroom Ragu adapted from Gabe and Katherine Thompson's Mushroom Ragu. In a small heatproof bowl, combine porcini mushrooms with 1 cup of boiling water and let stand for 15 minutes. Remove rehydrated mushrooms from soaking liquid and squeeze to remove excess liquid. Reserve both the mushrooms and liquid. Using a food processor, chop the cremini and rehydrated porcini mushrooms, until finely chopped, almost pureed.You will need to complete this in batches. In a large dutch oven or saucepan, heat oil over medium-high heat. Add the onions and garlic and season with salt. Once the onions are soft and beginning to golden add the tomato paste and chili flakes. Stir constantly for about 5-10 minutes. The paste should begin to caramelize. Add the chopped mushrooms and cook for 30 minutes, stirring occasionally, until mushrooms darken and mushroom liquid is cooked off. Add wine to deglaze. Stir until mixture is dry and wine has evaporated. Stir in the basil. Add the porcini soaking liquid and simmer for 10 minutes. Season to taste. Cook the penne according to package instructions and strain. Combine the penne and heated ragu. Serve immediately. 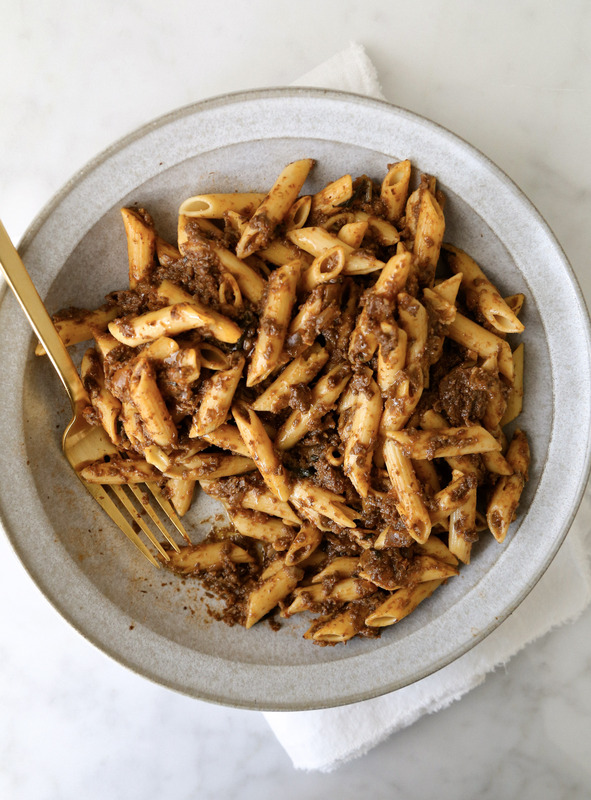 This entry was posted in Main Dishes and tagged comfort food, italian, mushroom ragu, Mushrooms, new york, pasta, ragu, sauce, vegan ragu, Vegetarian. Bookmark the permalink. I was craving this sauce after having gone to L’Artusi so we made this. I’m not sure if it’s the same as L’Artusi’s, because I couldn’t remember what it was like as soon as I had a bite of this delicious ragu! The second night we added some cashew cream that we had made, also great.